Luxury Cabin Overlooking Town. Sleeps 10. Custom Hot Tub, Outdoor Fireplace, and Gourmet Kitchen! Luxury finishes, incredible views, great location, custom copper hot tub, gourmet kitchen, and the list goes on! 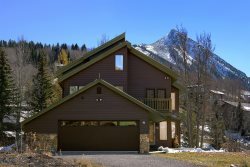 Foxtrot Cabin, just completed, is one of Crested Butte's most comprehensive remodels and is ready for your family or group to make memories in. Pull into the property and park on the cobblestone driveway inspired by a chateau in France or park in the heated garage to insure your car is warm and toasty on those chilly Colorado mornings. Step inside the cabin and take a deep breath, you're on vacation and this home won't disappoint. The entry hall of the home overlooks the great room and looks all the way through the home to the incredible views overlooking town. There is a powder bath in the entry hall with great detail including real tree legs on the sink! The main living area boasts 2 sitting areas, a 55" Smart TV, a gas fireplace, a wood burning fireplace, and a gourmet kitchen and dining area, all surrounded by picture windows providing wrap around views of the surrounding mountains. Step out onto one of the fabulous decks and have a morning cup of coffee or sit around the outdoor fireplace at the end of the day and swap stories about your Crested Butte adventures that day! The master suite is on this level as well and has a king bed with incredible views and a door to the flagstone patio and outdoor fireplace. The master bath has an infinity tub with champagne bubbles, and a steam shower. Warm your towels in the heated towel drawer and while we normally don't talk about the water closet, the electronic toilet is definitely cool! Touch screen controls, ambient lighting, and a lid that senses you are in the room and opens are just a few of the features! Downstairs you will find 2 bedrooms both with queen beds and en-suite baths. The hall bath for the bunk room even has a hidden step designed just for the little ones to reach the sink. Relax in the sauna with Pendleton towels or step outside to the custom copper hot tub with fabulous views. The common area downstairs has a 65" TV and is set up for all the streaming television you can handle. Move the comfy chairs aside and 4 custom bunk beds are hidden in the mosaic wood wall. Each with a reading light and comfy mattress, the kids may have found their spot! Regardless of season, you deserve to treat yourself to Foxtrot Cabin. Destined to become on of CB's favorite vacation rentals!